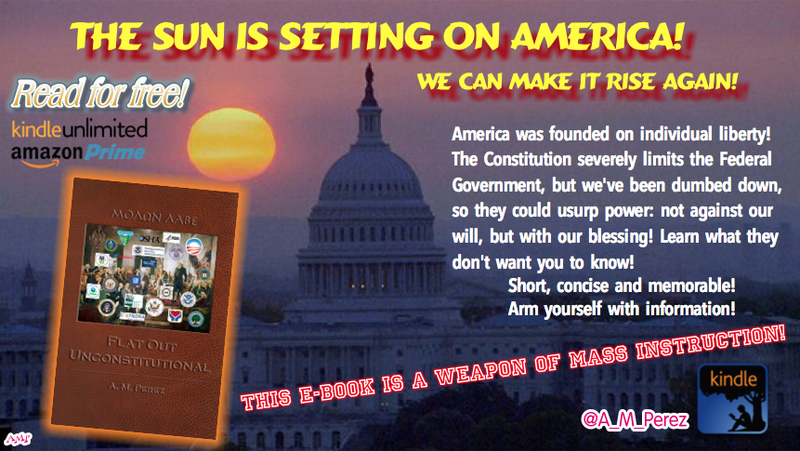 Learn everything that you need to know about the Constitution and how the Federal Government ignores it all in one brief, concise, and memorable E-Book. Public schools will not teach what this book covers, because keeping the people in the dark keeps others in power. It is not conspiratorial in nature, not an opinion piece and not really an explanation of the Constitution. The Constitution is rather easy to read and needs no explanation or interpretation. It is a first time introduction or reminder for some to the actual text of the Constitution and how it is grievously violated by government at all levels, but especially the Federal Government. It is astounding how much the Federal Government does that we have grown to expect from them, but is in fact unconstitutional. You can’t go wrong by reading Flat Out UnConstitutional! Get it for Kindle on Amazon! Free for Amazon Prime and Kindle Unlimited! It’s no longer free for Amazon Prime (as of 2/6/2017) = $4.99 now. It should be. I didn’t change that. Maybe Amazon did. I don’t have any control over it. I can see it is still free for Kindle Unlimited. I never received any notification telling me that it would no longer be available to read free with Prime. Sorry about this. Thanks. Maybe if more people complained to support it would help. I somehow doubt it, though. I have been Shasowbanned from Twitter also – Member of gab.ai now MAGA_VOTE. I just hope we are not being marked on the nets! It’s one foot in front of the other. Tow your own wagon uphill. Keep up the great work.